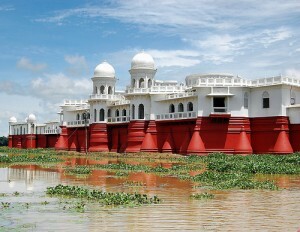 A place in water, Neermahal, which’s 53 km away from Agartala looks like a fantasy castle floating on water or Rudrasagar. Govt., of India has recently declared Rudrasagar the 13th National Lake. The palace of Neermahal covering an area of 3 sq. km was the summer resort of Maharaja Bir Bikram Kishore Manikya Bahadur who built this palace with British architects. Fishing and boating in soothing breeze in Rudrasagar are pleasant experience. It is also an offshoot enjoyment watching the flyaway view of a heavy flock of migratory birds when the sun starts setting over Neermahal. It is also unique to experience the joy of sound controlled fountain there. Tripura Government is all set to open a floating restaurant on Rudrasagar. This entry was posted in Neermahal, Tripura. Bookmark the permalink.